ALBC was invited to a couple of events in the Northeast region of the U.S. that spanned several days. The first event was a rare breeds meeting in Troy, New Hampshire, to commemorate the establishment of the new American Kerry Cattle Society and to bring together rare breed owners and enthusiasts for a day focused on rare breed efforts in the Northeast. Afterwards I headed to New York to meet with the folks at Tilley Foster Farm in Brewster, Stone Barns Center for Sustainable Agriculture in Tarrytown, and finally the Astor Center in New York City. This is the first of four installments about the trip . Landing in LaGuardia Airport seemed logical since the trip in the Northeast would end in this area. After picking up the rental car, I made my way north for the meeting in Troy, New Hampshire. Having lived in Rhode Island for many years, I thought I would stop in and stay the night with friends before heading to the Kerry cattle meeting the following morning. As it turns out, before I got out of New York City, I received a phone call to inform me that the meeting was postponed due to extenuating circumstances with several of the organizers. It was a great disappointment to miss the opportunity to meet with the breeders in this region but hopefully the opportunity will come around again. Since I had plans to stay with friends in Rhode Island that evening, I decided to make the best of the circumstances and the extra time that I had on my hands to visit some farms in the area. 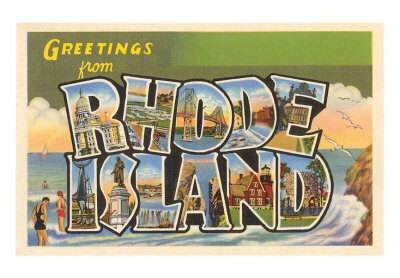 Rhode Island was once a strong agricultural force in early America and what most people do not realize is that it also served as a great center of horse breeding during Colonial times in the 17th and early 18th centuries, especially in and around Narragansett. The most notable equine accomplishment came in the form of a breed called the Narragansett Pacer, which got its name from the local Native American tribe from the southeast portion of the state. Prior to the development of proper roads that could accommodate carriages, the Narragansett Pacer was the “Cadillac” of its day and was famed for the comfort of its gait and the ability to travel long distances without tiring. At the height of the horses’ popularity, a Rhode Island clergyman by the name of James MacSparran wrote of them “I have seen some of them pace a mile in little more than two minutes, a good deal less than three.” At that time the Narragansett Pacer was also the favored mount of General George Washington. 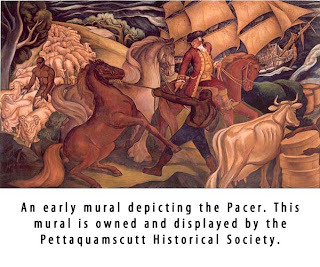 Local lore about the origin of the Narragansett Pacer tells of the breeds development beginning with Lt. Governor Robinson in the early 1700’s. The most famous of his stallions was an animal by the name of “Old Snip” which is said to be the father of the Narragansett Pacer breed. Some speculate he was an Andalusian while others ponder he could have been an Irish Hobby. His origins will never be certain but he was considered an important stallion for Robinson’s horse breeding efforts. In Colonial Rhode Island horses were managed along the coast by fencing off peninsulas and allowing the horses to run wild, feeding on the salt grasses in the marshes. This management made for outstanding horses that were toughened by the feral lifestyle and admired for their vigor. 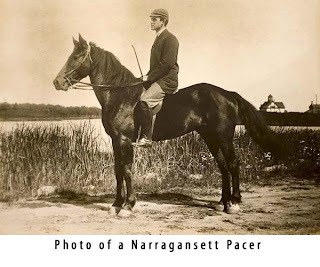 The Narragansett Pacer became the most sought after riding animal in New England and for plantation use in the southern colonies and even in the Caribbean. This ultimately became the downfall of the breed when coupled with the decline in large scale horse breeding in the region. The enormous, early plantations began to diminish in size as families grew and land became subdivided among the owners’ children over subsequent generations. At the same time, horse buyers were sent to Rhode Island to secure large numbers of horses for plantation use. In particular, one un-named purchasing agent was said to have come to Rhode Island to acquire large numbers of the finest animals for importation to Cuba. It was said that no good horse available for purchase went unsold to this man upon his visit. The end result depleted the breeding population and had a dramatic impact on the future of the breed in Rhode Island. By the time breeders realized that the breed was in danger of disappearing, the fate of the Narragansett Pacer was set for extinction. There are no conclusive dates for exactly when the breed disappeared completely. One of the later references to the breed appears in a footnote within James Fenimore Cooper’s Last of the Mohicans published in 1826. Cooper mentions that “Narragansett Pacers are still in much request as saddle horses” when he wrote the famous novel. Locals from coastal Rhode Island say they persisted in the southern coastal counties in small numbers until the later 1800s before they disappeared altogether. This hard lesson about the security of domestic breeds made me wonder how many others have met the same ending over the years. To me, the idea drove home the importance of the work we do for ALBC and how easily a breed can slip away if we are not vigilant. While making my way through Rhode Island, I made an effort to drive by the historic farm of Lt. Governor Robinson. Although the farm is not open to the public, the property is still owned and lived in by his descendants. Today there are no horses to be found on the carefully manicured grounds. I am told by friends of the family that a period painting of their famous Narragansett Pacers still sits above the mantel of their fireplace and is the last remnant of the family’s legacy with the breed. Following the visit to the Robinson farm, I traveled a short distance up the road to another historic farm called Casey Farm. Unlike the Robinson property, this colonial period farm is open to the public and has been in continuous agricultural production since 1702. (An outstanding accomplishment by any measure!) 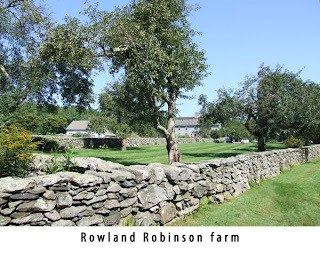 The farm is currently owned by Historic New England and operated by its caretakers Polly and Mike Hutchinson. 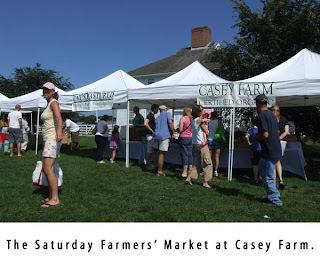 The farm operates a very successful CSA for its produce and also offers a summer camp and a very popular farmers’ market on Saturday mornings. I happened to be there on market day and enjoyed viewing a wide variety of products ranging from cheese, to honey, to a wide assortment of organic produce and meat. While wandering around the farm, it was great to see that they have incorporated several heritage breeds into their organic production system including a sizeable flock of Dominique chickens, Heritage Turkeys, and Belgium draft horses. 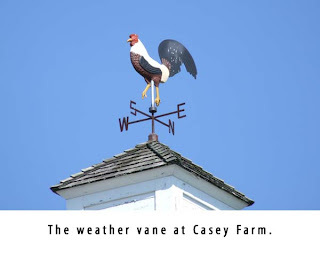 A reminder of yesteryear stood atop the barn in the form of a weather vane depicting an Old English Game chicken which, no doubt, would have been a resident on the farm during colonial times. In the next installment, the trip takes me back to New York state and to the endangered breed farm project of George Whipple at the historic Tilley Foster Farm. I must admit that I am a CRAIGSLIST user. I love to look at the events going on in my area, the pets for adoption, and the random things that people try to sell. From jewlery to cars, to clothes and boats, Craigslist sells it all. 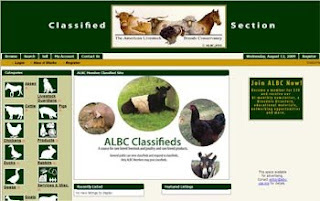 Over the years, many ALBC members and non-members have suggested that ALBC develop a similar "classified" site for rare breed breeders, animals, and products. Many members say that marketing is an essential part of being able to afford to raise these breedes, and they've been searching for a vehicle to help market their products. After much discussion and development, ALBC is excited to announce the release of a classified section on the ALBC web site. The site was launched last Wednesday, August 12, and already we have nearly 100 registered users. We hope to increase this number as additional members learn about the service. The site will also be marketed to those who may not be ALBC members, but may be interested in rare breeds or their products. Check out the new site and let us know what you think. You must be an ALBC member to post to the site, but anyone can view ads and respond to sellers. On July 18, 2009, the Sedgwick County Zoo in Wichita, KS, welcomed a baby Poitou donkey. The Poitou, a young female named Vivienne, is the first of her kind born in a zoo in North America. Poitous are categorized as Critical on ALBC's Conservation Priority List, meaning there are fewer than 200 annual registrations for this breed in the US and an estimated global population of less than 2,000. The Poitou is an ancient French breed. The breed was developed in the Poitou region of western France, where mule breeding has been documented for over one thousand years. The breed nearly became extinct after World War II, when the demand for mules collapsed. The Poitou’s limited geographic area increased its vulnerability. Fewer than 80 Poitous survived in 1980. Today, the American Livestock Breeds Conservancy works with breeders around the country to help increase the number of Poitous. This breed has a rich history that need not be lost. Congratulations and thanks to the Sedgwick County Zoo for helping to support rare breeds by breeding them and sharing them with the public. Enjoy a video of the Sedgwick County Zoo's baby Poitou. Click here for more information about the breed.